Let's All Play: Breakout or Fakeout? CNBC's "Fast Money" kicked off their show Tuesday afternoon with a game they called "Breakout or Fakeout." To be honest, I usually have the T.V. on mute the vast majority of the day. However, this segment was fun to watch as the traders took turns making their "call" on whether stocks will be able to break out of the current resistance zone and move to new highs - or - reverse here at the top of the range and slide back down. As long-time readers know, I simply abhor the idea of trying to predict what is going to happen next in Ms. Market's game. The bottom line is while many gurus have come and gone since I entered the game in the early 1980's, NO ONE has been able to consistently call the market's near-term direction with any degree of accuracy, for any length of time. But, this doesn't mean that collectively as an industry we stop trying. And it was amusing to listen to the fast money folks each take their turn at predicting whether the current move would result in a breakout to the upside or represent a "fakeout" for the bearishly inclined. So, although I am likely the antithesis of a "fast money" trader, this morning I thought I'd weigh in and take a turn in the game. Before I register my vote, let's look at the charts of the various indices. The key here is to see if all the major indices are rowing in the same direction. In short, if the indices are all singing the same song, then the likelihood of the move continuing in the current direction are improved. If not, well, the odds of a fakeout are higher. We begin with the current market leaders: Small-caps and the NASDAQ 100. The chart of the Russell 2000 makes the situation pretty darn clear as there is obvious resistance, right here, right now. 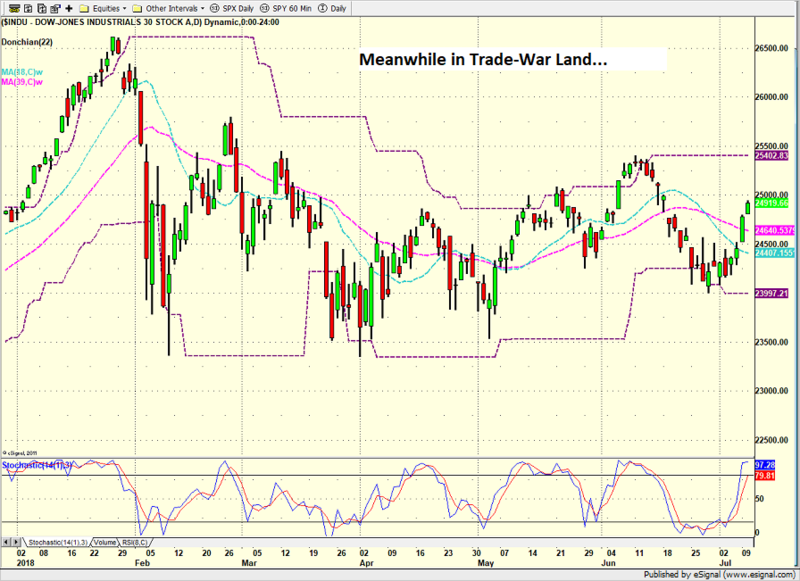 The bulls argue that the recent pullback was just a pause in the uptrend. 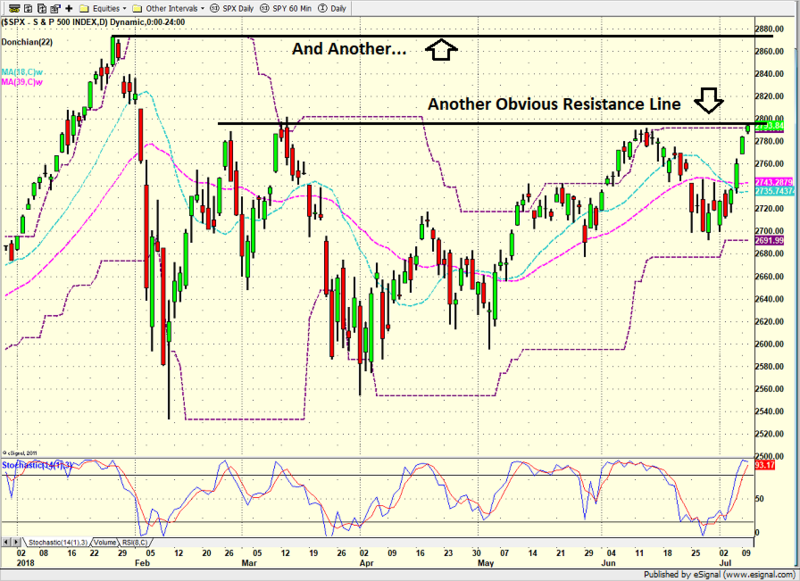 The bears counter with the idea of a double top on the chart. Game on. The Small-caps have been leading the pack recently due to the facts that the group as a whole (a) isn't likely to be impacted by the trade war and (b) is benefitting from the uptick in economic growth. However, prior the trade war issue, the FAMANG's and the other tech leaders that reside in the NASDAQ 100 were clearly the market leaders. So, let's check in here next. I think it is safe to say that the same situation is seen on the chart of the NASDAQ 100 and the question at hand is clear. 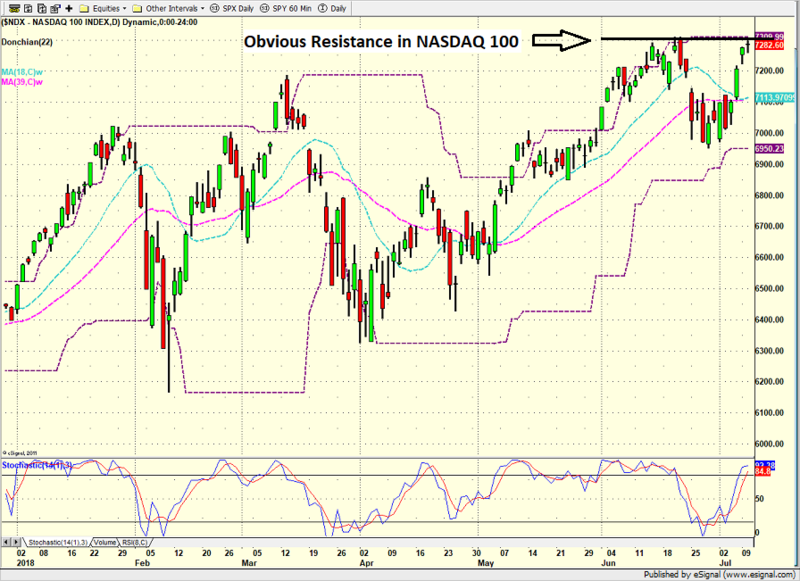 Are stocks ready to break out or will this become a "fakeout," with the NDX acting as it did in mid-March? Next up is the Dow Jones Industrial Average. Although I personally don't put much credence or spend much time with this index, the rest of the world still does. So, we need to take a look at the action. To be sure, this chart is a horse of a different color as it looks nothing like the first two. It seems obvious that this is due to the concerns about the impact a trade war will have on some the country's biggest multinational companies. 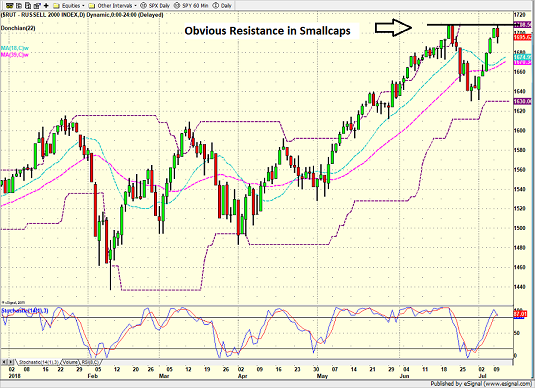 But from a purely chart perspective, the Dow is not "set up" for the breakout/fakeout game right now. Finally, let's move on to the S&P 500, which, in my book, is a very good representation of the overall stock market. As you might suspect, the chart of the S&P is somewhere in between. 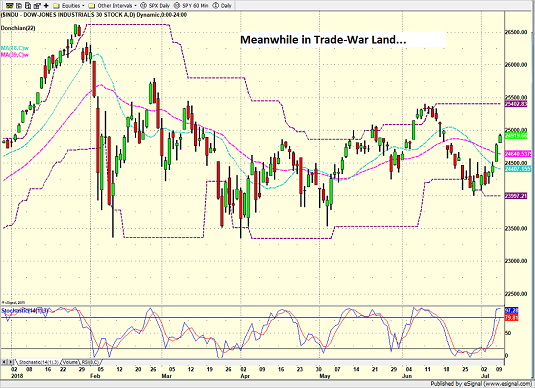 Yes, the index is sitting at important resistance around 2790ish. As such, we can certainly play the game here. 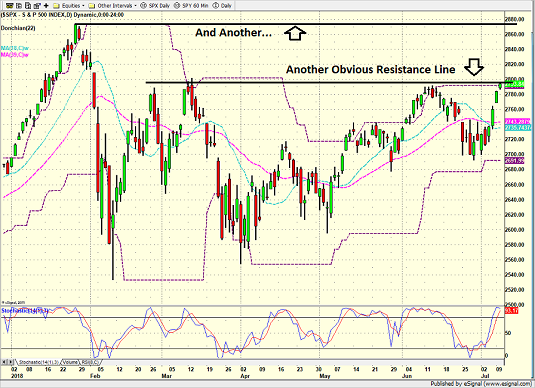 But, there is another, more important line in the sand overhead in the 2870 zone. From my seat, this is where the true "breakout" move would occur. So, point number one on this fine Wednesday morning is that the charts of the major indices are not aligned. Thus, the odds of them all making an enthusiastic break for the border (representing a momentum thrust) aren't as strong as the bulls would like. Point number two is the fact that my big-picture market models have seen some meaningful deterioration in recent weeks. In and of itself, this doesn't mean that a fakeout is on tap. But, from my perch, it certainly swings the odds in that direction. Then there is the news flow. 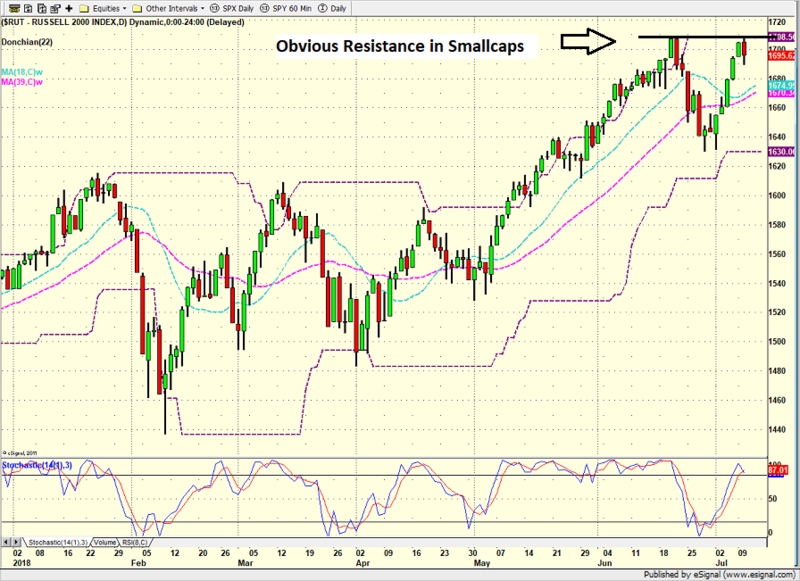 The bulls argue that the earnings season will save the day and push stocks through the current overhead resistance. After all, another 25%+ earnings season will wind up being a positive, right? But... You knew that was coming... The team on the other side of the field contends that issues such as the fresh list of tariffs on another $200 billion of Chinese imports, the mid-term elections, the move in the dollar, the potential for inflation to perk up (this morning's PPI report was hotter than expected, by the way), and the weak action around the rest of the world, will combine to keep the bulls locked down. As such, our furry friends are firmly in the "fakeout" camp here. To be sure, I do NOT manage money based on this game or market calls in general. But since the game is kinda fun, I guess my vote goes to a "fakeout" in the near-term and a breakout later in the year - assuming my market models can improve as some of the current uncertainty resolves itself. Yes, I know that I'm breaking the rules of the game. But that's just the way I prefer to play. Publishing Note: My next report will be issued Monday morning.